Designs and manufactures industrial drill bits, with sales supported by established reputation, quality engineering, product patents and technical services. Boasts veteran family management with 42-year tenure, 57%/£126m shareholding and long-term perspective. Offers financials that include respectable margins, a cash-positive balance sheet and opportunities for greater efficiencies. August’s interim figures and October’s Q3 update had already suggested MCON would report significant financial progress. In the event, total revenue gained 21% while operating profit before exceptional items advanced 16%. The purchase of Driconeq — a Swedish drill-pipe specialist — this time last year made MCON’s underlying growth harder to determine. I am not sure my Driconeq sums are correct. First-half sales of €8m reflect only the first three months post-acquisition, while second-half sales of €10m represent a full six-month contribution. MCON had initially claimed Driconeq would create extra sales of €21m during 2018. Nevertheless, my table does show (estimated) 2018 revenue from own-brand products gaining 10% — which matches the comments given by the chief executive. Reading between the lines, I am not sure Driconeq has performed as well as expected (my bold). The final dividend was maintained at €0.0105 per share, which left the full-year payout 2.4% higher. The dividend announcement was hidden within notes 21 and 30 of the accompanying accounts. These results were the first in which I noticed the term “drill string”. A drill string combines a drill pipe, a bottom hole assembly and any other tools used to make the drill bit turn correctly. MCON has traditionally developed and made industrial drill bits. “In recent years we have set out to assemble the full range of the drill string for different types of mining and construction piling. This provides us with the opportunity to deliver a full-service offering to end customers, as we now design and manufacture the key elements in the drill string. MCON appears to sell its drill bits to intermediaries, who in turn seemingly supply the end customer with the full drill string. I had always assumed MCON sold direct to the end customer. Driconeq’s drill pipes are not as profitable as drill bits. These results claimed Driconeq’s gross margin was 23% versus 40% for the ‘core’ group. Driconeq was acquired for €7.8m, incurred further transaction costs of €166k and contributed earnings of €396k during the nine months of ownership. 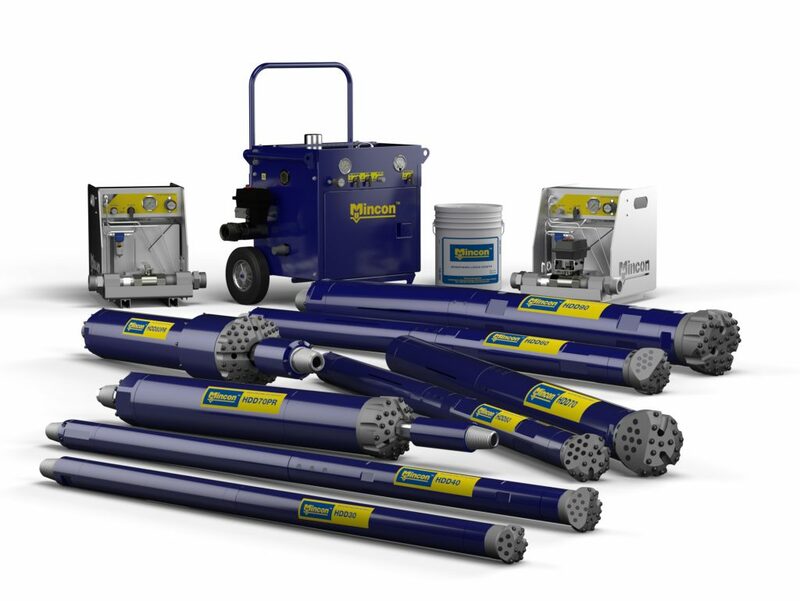 “We believe we are moving towards the commercialisation phase of the hydraulic hammer systems (or “Greenhammer” systems) in 2019. 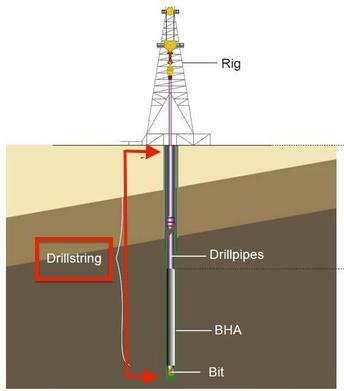 The system on the rig, prior to the drill string being added, weighs about eight tonnes, and eleven tonnes when the full drill string is added. This is not a small system or easily replicable, and we have placed patents around the system to protect it. The system is more than just the hydraulic hammer; it includes all the drill string and the supporting on-rig infrastructure and handling. It is a disruptive technology, offering tremendous savings in fuel, with an ambitious planned partnership programme in our customer base, and there is growing interest from other potential customers with the problems that this technology can address, such as hard rock, and high-altitude drilling. Greenhammer has been seven years in the making and to date has involved capitalised development costs of €3.4m, of which €0.7m was capitalised during H1 and €1.0m capitalised during H2. These results revealed exactly where the Greenhammer development costs reside within the cash flow statement. Delivery backlogs due to customer demand exceeding manufacturing capacity during 2017 and 2018. At €49m, year-end stock levels represented a huge 42% of revenue. Stock in the factory and warehouses is now held on average for six months rather than the nine months seen during 2014. MCON may always carry relatively high stock levels because such levels could support a competitive advantage. Capital expenditure was €7m during H2 to total almost €13m during the year. The total cost of the hefty capex, the substantial stock investment, the Driconeq acquisition, the notable Greenhammer expenditure and the dividend came to €40m. 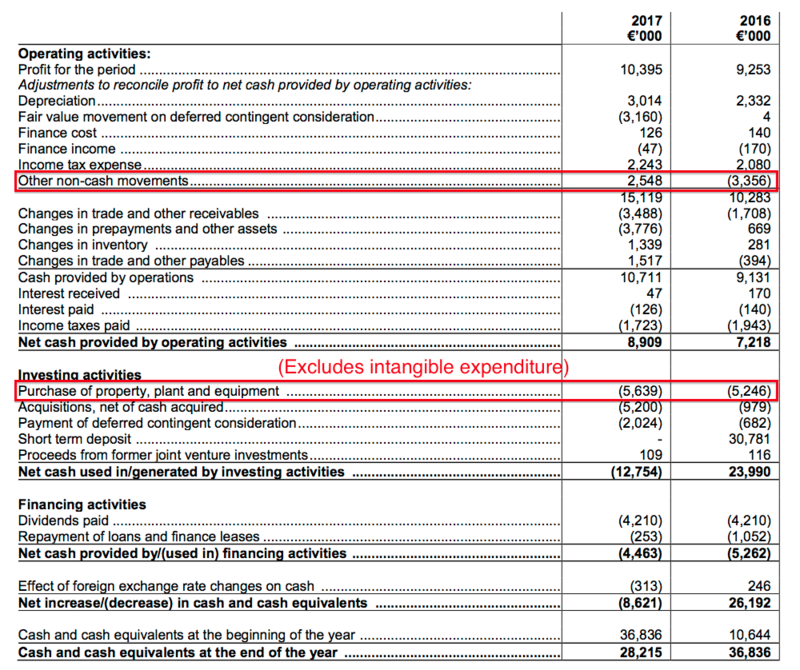 Of that €40m, €14m was funded by earnings, €5m funded by extra debt, €1m funded by other cash movements and the remaining €20m funded by cash in the bank. 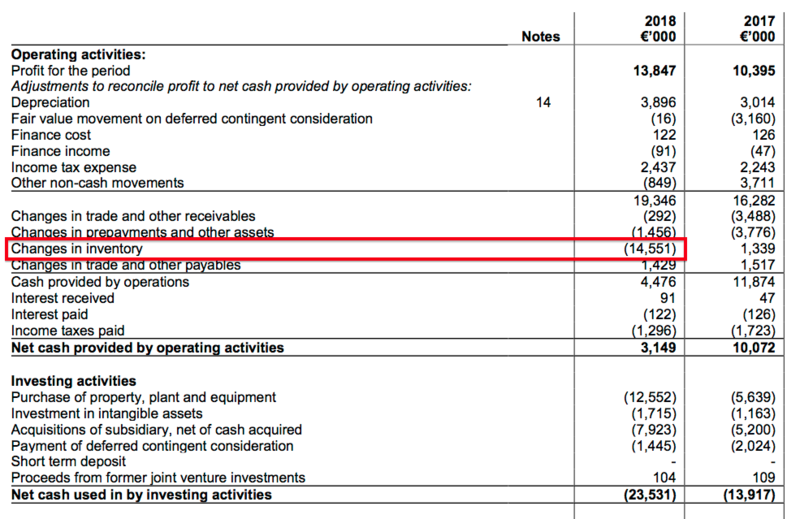 Cash in the bank therefore dropped from €28m to €8m, while debt advanced from €2m to €7m. 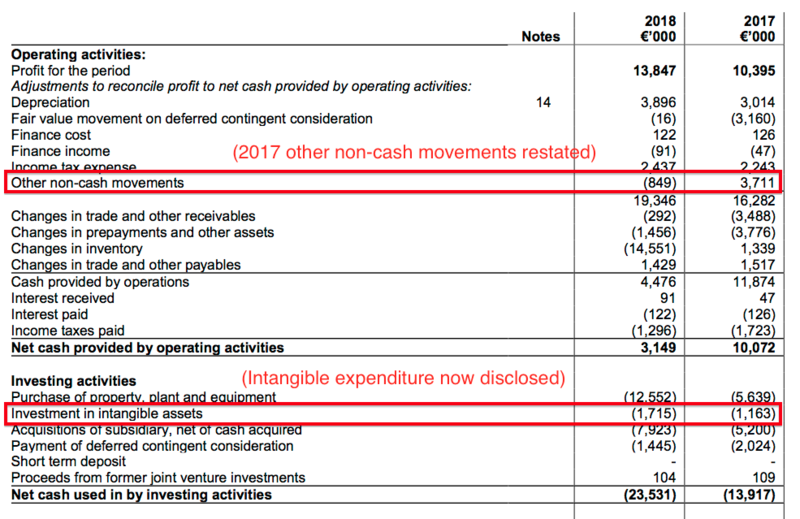 Net cash ended the year at just €1m — excluding €5m earmarked for possible acquisition earn-outs. Of MCON’s €61m aggregate operating profit from 2014 to 2018, an enormous €30m was absorbed into working capital. During the same five years, total capital expenditure has been double the total depreciation charged against earnings. Five years ago MCON raised €47m through its flotation. Those proceeds have now all been spent. MCON said the operating margin excluding Driconeq was 15.2%. ROE could improve if/when the aforementioned stock levels reduce and/or when the aforementioned recent capex generates a suitable return. Stock and property, plant and equipment represented a significant 72% of the year-end balance sheet. MCON carries no pension obligations. This time last year, MCON claimed 2017 had looked “very much like the first [year] of the current upturn”. MCON did not say whether its customers continue to enjoy an upturn while the group consolidates its acquisitions. 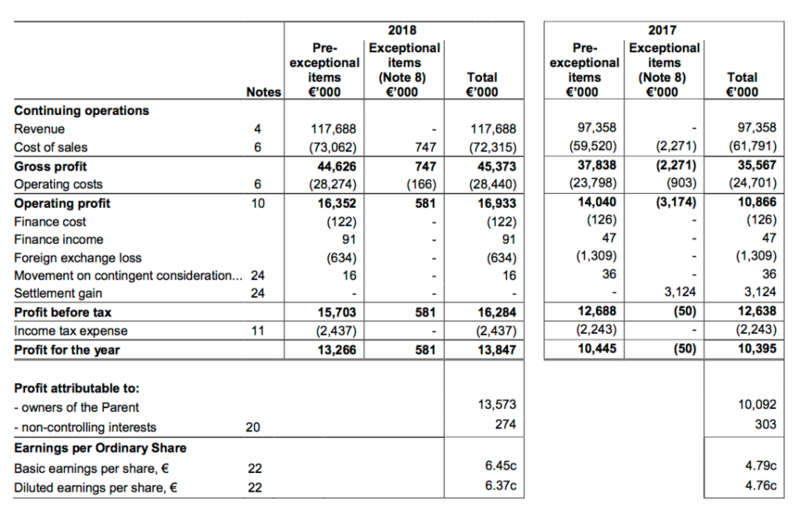 MCON’s €16.4m operating profit for 2018 translates into £14.0m at £1:€1.17. Taxed at the 15.5% rate applied in these results gives earnings of £11.8m or 5.6p per share. 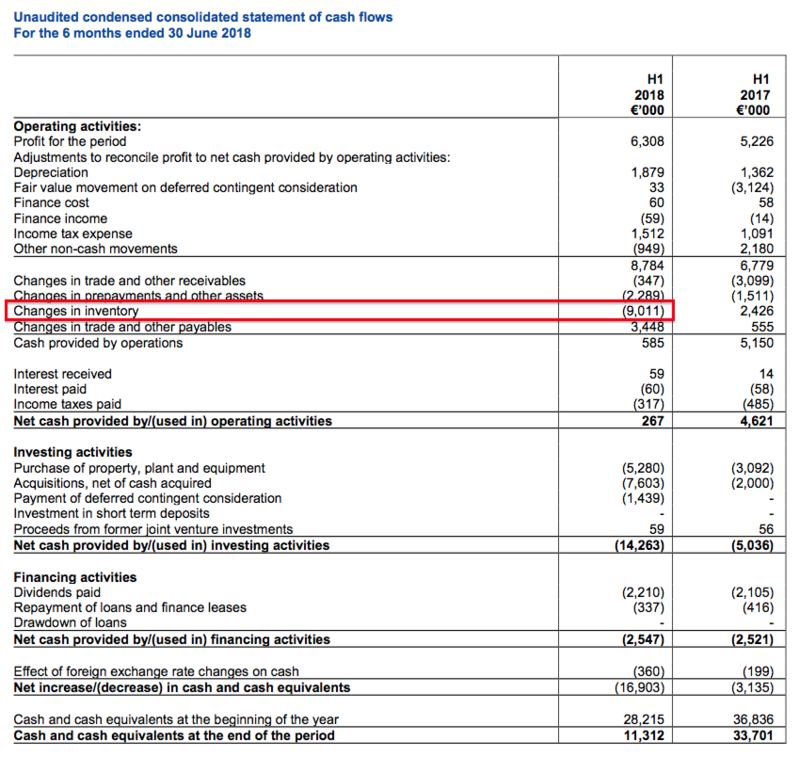 Adjust the £221m market cap for the net cash and potential acquisition earn-outs, and the P/E is approximately 19. No adjustment has been made for the capitalised Greenhammer expenditure. Capital is released from stock and leads to a greater ROE. The trailing €0.021 per share dividend equates to 1.79p per share and supplies a 1.7% yield (before Irish withholding taxes for UK-resident investors).